During finals week, sophomore Michael Erisman expects his stress level to ratchet up. A big portion of his grades at Grand Canyon University rest on how well he does in his finals, so the stakes are high. “Stressful? Yes, finals always are. I just try not to have a nervous breakdown,” said Erisman, an Electrical Engineering major from Modesto, Calif.
To help the many students like Erisman, GCU sponsors Finals Focus, nearly two weeks of stress-busting events and services. It includes extended library hours, extra tutoring and even hugs. At “Mid-Night Breakfast: Winter Thunderland,” students can stay up with free coffee and breakfast burritos served from 10 p.m. to midnight Wednesday on the Quad. Organizers expect a record 3,500 students for the third annual event. Expect Thunder to drop by with holiday cheer. “It’s a stressful time of year, and we want this to be a rich tradition on campus, a time for students to take a break from studying and recharge,” said Brittney Sanford, a program coordinator in the Office of Student Engagement. In addition, The Grid will offer Brain Food Bundles, food packages for late night study sessions, and Red Eye Promotions, coffee and dessert specials at rotating campus locations. On the academic side, the Learning Lounge is extending its hours from 8 a.m. to midnight Monday through Thursday at its eight GCU locations. Weekend hours are 8 a.m.-5 p.m. Friday, 10 a.m.-6 p.m. Saturday and 10 a.m.-5 p.m. Sunday. The Learning Lounge offers online, individual and small- and large-group tutoring. The sessions are taught by students who received an A in the class. Along with the Learning Lounge, the library is extending its hours for finals from Monday, Dec. 5, to Sunday, Dec. 18: Monday through Friday, 7 a.m. to 3 a.m., and weekends, 10 a.m. to 3 a.m.
Students in need of a spiritual or emotional boost can drop by Fuel for Finals, an event that offers prayer, words of encouragement, treats and apple cider. 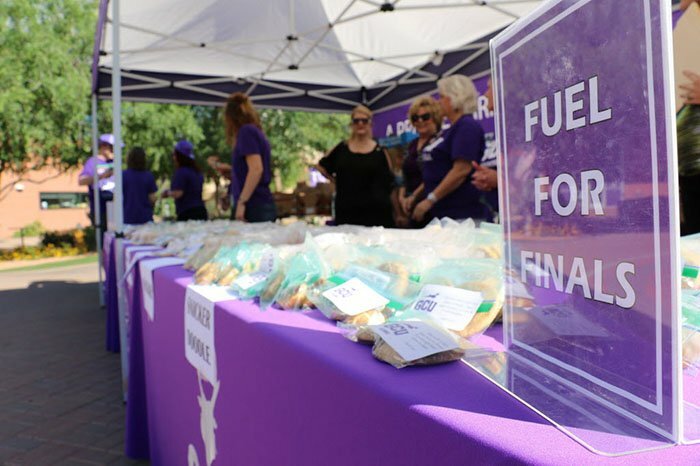 Parents of GCU students will staff the event, which will run from 9 a.m. to 2 p.m. Thursday, Dec. 8, on The Grove lawn and the south end of the Promenade. “We just want to be able to tell students to hang in there, give them a hug,” said Jeanne Lind, parent and family program coordinator for the Office of Student Engagement. Avoid all-nighters. A tired brain struggles to retain and recall information. Be sure to get a good night’s sleep every night. Stay physically active. Sitting in front of books or a computer for an extended period of time causes brain fog. The antidote is exercise, which boosts the blood flow to the brain. If there’s no time for a workout, get up and take a short walk around campus. Turn off social media. It’s too easy to get distracted by Twitter. If going cold turkey is too tough, limit checking your favorite platforms once a day for no more than 10-15 minutes. If you drink more coffee, drink more water. Coffee dehydrates, and that can cause a fuzzy mind. Feed the brain well. Aim for a healthful diet of whole grains, fresh vegetables and lean proteins. Take advantage of the help offered by Finals Focus.